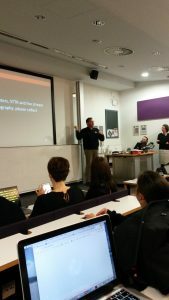 “I feel very fortunate to have attended the UCL 10 year anniversary of the BSL Corpus celebration, and am extremely excited to be able to share the YouTube link showing the whole of the event. “I can’t recommend it strongly enough for anyone interested in BSL, and an absolute must for students. The researchers and presenters explain why the research took place, how they filmed 249 Deaf BSL users, and the fascinating insights they now have into regional variations in BSL, variations according to age, and how to use the Corpus and Signbank. “I have been using it since the SignBank Dictionary was launched. This was when I was studying Level 2. Up until then I had been learning vocabulary from books and different websites with a few signs here, a few signs there. To have so much vocabulary in one place was amazing! “I have continued to use the Corpus, watching videos to improve my receptive skills and to improve my facial expressions and BSL order. Now studying Level 4 I am finding the information about regional variations a fantastic resource to help with my linguistics essay. Clair Buttery- Marketing & Strategic Planning Officer for Dot Sign Language, and BSL Level 4 student.